Information pertaining to the state of the Alberta Paramedic Association. The Alberta Paramedic Association (the Association) has been working behind the scenes on the issue of Core-Flex and its elimination across the province. The Association sent out two letters on March 13, 2019 to Minister Gray and Minister Hoffman urging them not to issue any variances to hours of work after our research revealed significant paramedic health and wellness implications. We asked the ministers to consult the Association prior to making any exceptions to the updated safer work legislation that applies to all other health professions. We have not received a response to date and sadly we were recently made aware of a Ministerial Variance signed by Minister Gray, authorising the continued use of the core/flex model that empirically risks Paramedics health and wellness. This variance allows for an exemption from the current employment legislation. Some of the wording is not clear to us at this time. Our attention however, focuses on section 43.86(3)(c)(i),(ii) of the Employment Standards Regulation (regulation). 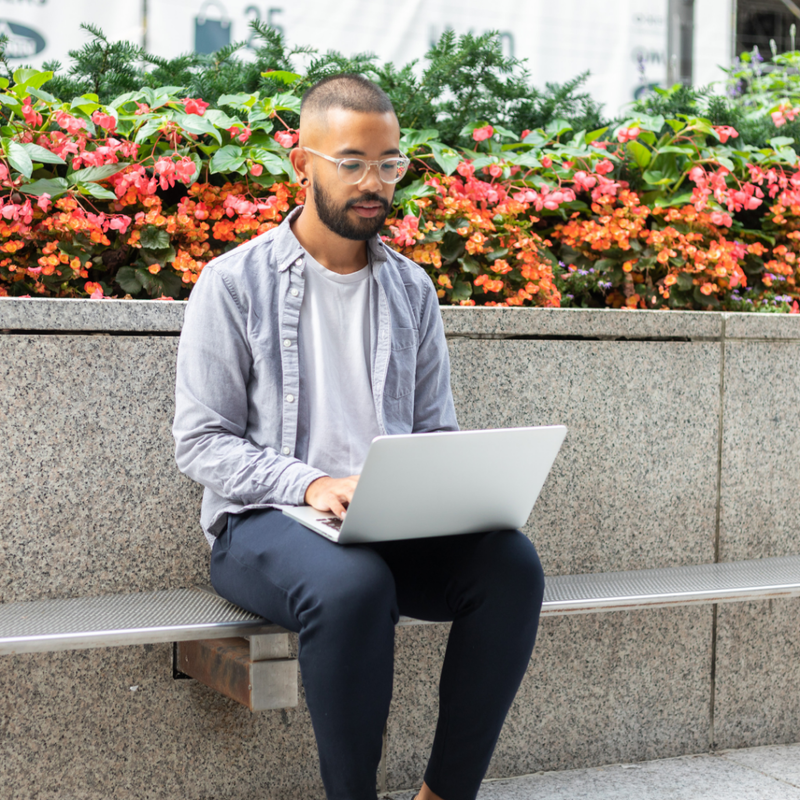 The regulation identifies a requirement to consult with either the representative bargaining unit or employees when applications for variances are made to the Minister. This would indicate that either the bargaining unit or individuals were consulted in this process. We have yet to be in contact with a single core/flex practicing paramedic that was included in the consultation process. The Association will continue to lobby hard to resolve this risk and move forward a culture of Paramedic health and wellness. It is important for you to be informed. Please read the attached letters and see the signed variance by Minister Gray. If you wish, offer your comments on Twitter or Facebook. If you feel that this may be something of value related to election issues, post something within the April 16, 2019 Election section on our website home page. As part of our consultation, we’d like to know what matters to you. 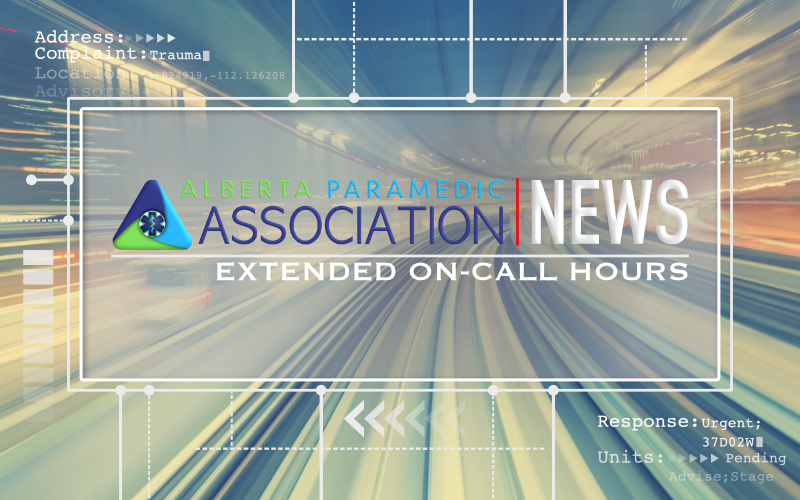 Thursday, November 29th, the Alberta Paramedic Association released part one of an impact study investigating the effect of extended on-call shifts on the health and wellness of the paramedic. During that research, there were major risks to the public identified. Public protection is the role of the Alberta College of Paramedics, therefore we provided the college with the urgent public risk findings on the very same day. 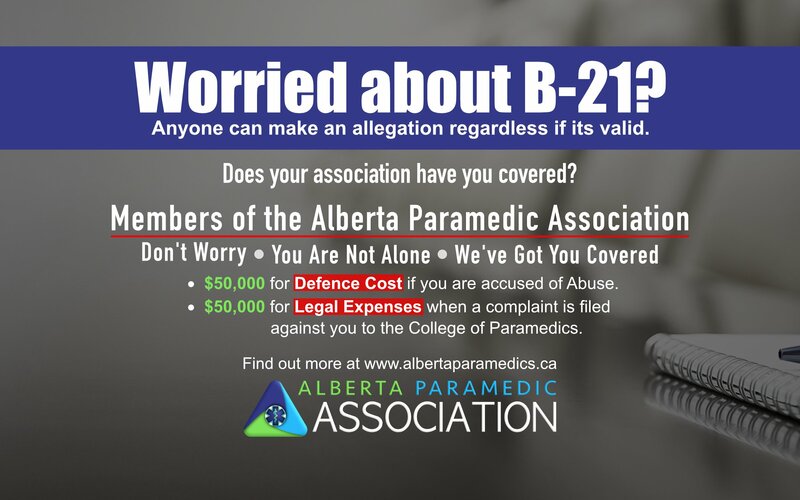 The Alberta College of Paramedics has provided a response to the Association that we want to share with you. This is an unacceptable position for the College to take on a serious public risk. “Without proper regulation, paramedicine will unfortunatly experience a fatigue driven tragedy” Association President Dusty Myshrall writes, “Don’t wait for a fatality to happen”. Bill 21 – Association Members are Protected! Bill 21: An Act to Protect Patients was passed on November 8 2018 to protect patients from sexual abuse and sexual misconduct by regulated health professionals in Alberta. Alberta Paramedics are regulated health professionals under the Health Professions Act. The Alberta Paramedic Association commends the Government of Alberta for introducing legislation aimed at strengthen patient protection by introducing mandatory penalties for sexual abuse and misconduct. The Association will continue to research and develop strategies for paramedics to maintain the highest level of protection for patients from sexual abuse and sexual misconduct. The Association is pleased to see our regulator, the Alberta College of Paramedics (College), has started its consultation process. The Association encourages all members to participate in their consultation by providing comments and feedback in their survey link: https://www.surveymonkey.com/r/BM5NK87. While we wait for the new Standard of Practice to be developed by the College, the Association wants you to become better informed on Bill 21. We encourage all paramedics to access this link https://www.alberta.ca/protecting-patients-against-sexual-abuse.aspx to critically analyze the new legislation. Further, the Association’s role is not only to provide awareness and voice to the members on breaking issues, but in this case, to ensure personal safety if a legal dispute arises. It is possible that there may be circumstances where paramedics may see allegations from the public that fall into the definitions within Bill 21 that may be vexatious or unfounded as part of the regular day to day work in providing care. Therefore the Association has ensured that when necessary, our members are provided with financial resources to legally defend themselves from wrongful accusations of abuse. The Association stresses the importance of carrying proper professional liability insurance. We want our members to know that the Association has confirmed with our insurance provider (ProLink) that members are covered for allegations involving sexual abuse and misconduct. Any record of discipline or criminal conviction or conditions placed on a paramedics practice permit related to sexual abuse or misconduct must be published and for an indefinite period. A Hearing Tribunal that finds a regulated member (paramedic) guilty of sexual abuse of a patient must cancel the member’s practice permit and registration or suspend it when a paramedic is found guilty of sexual misconduct. A Patient Relations Program is to be created by each regulator, including a fund to provide treatment or counselling to patients affected by sexual abuse or misconduct by regulated health professionals.